They call it the Arizona Beach, but it isn’t in Arizona—the state doesn’t have a coast, not even a whiff of salt air, because Arizona is landlocked. Yet there’s a beach Arizona claims as its own less than an hour south of the Mexican border on the Sea of Cortez. And that beach, thanks to Allegiant Airlines non stop service from Bozeman to Mesa, Arizona, while not the closest to Montana in miles, can be reached relatively quickly after a 90 minute flight ($150 round trip) and 4 hours by car—a magical drive through the most beautiful desert on earth. After flying into Mesa’s Gateway Airport, a small affair comparable to Bozeman’s Gallatin Field, travelers can rent a car, head southwest via Highway 238 toward Gila Bend, then to the border town of Lukeville. Cross the line into Sonoyta, Mexico, and drive to the Sea of Cortez in about 45 minutes. The desert there this time of year strikes the eye as a vast, verdant cactus garden—that’s verdant as in green, and cactus as in Saguaro, the kind you see in Western movies. A real pleasure to drive through, and flying Allegiant, arriving at 1:30 p.m., you’ll probably have the pleasure of beholding the desert in late afternoon as tempered sunlight pours over the arid land and harsh, barren mountains like golden liquid. That waning light though and your southwest trajectory, if you stop to eat, may have you entering Puerto Peñasco on the Sea of Cortez at nightfall, with sometimes inadequate signage (it’s Mexico), unless you make haste across the border and eat in the car. So, to find your lodging, be sure to have great directions and functional GPS (again, it’s Mexico). Beachfront rentals at Playa Encanto, a serene and expansive beach south of town, remain fairly uncharted by satellite, so if you book in this slightly more remote but desirable location, you may find yourself roaming around the desert outside of town in the dark, trying to find your way. So plot your trip and waste no time. Puerto Peñasco, also called Rocky Point, amounts to not quite a bedroom community of Phoenix but a place where you’ll find plenty of Arizonans taking a break south the border. The North Americans you meet down there are mostly from Phoenix, looking for a place to get away, jump in the cool surf of the Sea of Cortez, fish, and find some off beat restaurants in a modest size Mexican town that has become partially Americanized. It’s a bit touristy near the malécon in the Old Port—with trinket shops and hawkers like most beach towns, but venture just a few blocks, or explore the Pinacate Biosphere Reserve, and you will find a more Mexican experience. Life forms stranded in tidal pools over vast expanses at low tide there have a hard time fitting into conventional categories in your brain, as necessarily animal, vegetable or mineral, and the abundance of clams, if you‘re up for it, will satisfy your linguine with clams, clams on the half shell, or steamed clams recipe prepared after a day of clamming on the beach, or at Bahia La Cholla, where with each low tide the entire bay recedes into the Sea of Cortez. One such clam left to its devices in a plastic bucket projected an appendage of pornographic proportions that nearly overturned the bucket, and had faint-hearted landlubbers swooning, then scheduling primal scream therapy in Sedona. Clam or alien life form? Hard to say. But worthy of ceviché? —Definitely, with a chilled Sauternes. Peñasco though is famous for shrimp. People rave about them and restaurants serve them in a variety of dishes. Try the Shrimp and Flounder Galicia at El Delfina Amigable in the Old Port, prepared with paprika and garlic. The Sea of Cortez whence those shrimp derive is apparently loaded with them, as it is with a renowned abundance of marine life including sting rays, sea tortoises, dolphin and sea lions—Jacques Cousteau having referred to this body of water wedged between Baja and mainland Mexico as the world’s aquarium. Indeed, at Playa Encanto and along the coast, where low tide leaves hundreds of yards of tidal pools, sandbars and rivulets, the diversity of creatures stranded there might inspire a 5th grade science project, a career in marine biology, or just an exquisite morning of exploration. Tell little Jimmy, though, not to bring home that dead sea tortoise (the size of a coffee table) mostly scavenged by gulls and buzzards, because it’s perfectly fine for something like that to decay on the beach, as it gets washed by surf and picked by buzzards, but in your trunk across the international border, maybe not. Perhaps the most curious thing is that many of these lifeforms seem unclassifiable—white, golf-ball size undulating puffs (plant or animal?) and toothpick-thin emerald green eels that look like radiant shoestrings but swim like snakes and burrow in sand. No classification issues with jelly fish or clams, but do they have brains—if not how do they know where they’re going? Behind Encanto where the desert meets the Morua Estuary (travel by car or kayak), fresh oysters can be had in a shack on the water for five dollars a dozen. There’s an oyster farm there, and a restaurant (the shack) yielding fresh delectable specimens. Unlike the ones I’ve had in Montana, they’re properly shucked, free of grit, and cut free from the shell. The place also serves ceviché with tostados, tacos and beer, and seems not to have a name. Just look for the signs leading into the desert on the highway east of town (toward Encanto) that read Ostion Fresca. Wine and dine there like a king for ten bucks. Locals bring their own tequila, by the way. That’s after a three mile drive through the desert, but careful at high tide when the desert road fills with sea water. Turn around, drive back to the highway, turn right, and take the next road into the desert toward the estuary. In town, Peñasco offers restaurants and beach bars with great views and disarmingly warm hearted people. Casa del Capitan hovers over the town and sea like a sentinel, offering stunning panoramas high above the Sea of Cortez, deep blue and vast. Oysters there run a dollar a piece, served with a generous platter of condiments. The price is still low, and well worth the jaw dropping view. Spend your late afternoon up there, as we did, waiting for sunset in the company of Don Julio Reposado. The night before I drove back to Mesa, I sampled the more Mexican side of life, 13th Street in town, where you’ll find strip joints and street walkers side by side with family restaurants and taco joints, depending on the hour. There, the hawkers aren’t hawking sunglasses but anything you want, they say. A friend had suggested a bar there called Chebelas, so I took a flyer, into the night and this long narrow crowded place with not a gringo in sight. 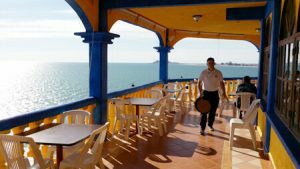 You hear all kinds of stories about Mexico, and it gets you thinking, but not at Chebelas, nor anywhere else I visited in Peñasco. To the contrary—you find warm hearted, good natured people who are a pleasure to know. Including at Chebelas, and draft beer for a dollar. The notorious El Chapo Guzman came to town a few years back, a local named Antonio told me. The army was with him, Antonio said. I didn’t get that, so I asked Antonio—You mean El Chapo’s army? Not exactly, Antonio said. It was the Mexican Army, the part of it that worked for El Chapo, who now by the way is in custody awaiting extradition to the U.S.—and he is calling for that extradition due to conditions and deprivations, he says, at Mexico’s Altiplano Federal Prison. Rocky Point, as Puerto Peñasco is called, fails to live up to the lore spread by the U.S. media as a dangerous south of the border town where you’re lucky to walk away with your life. It is not dangerous, though the highway north to Arizona is a hot spot, or has been, for trafficking, not that we saw any evidence. In December of 2013, though, a military style operation descended on the high rise condos west of town, the developed area, coordinated, it is believed, on the U.S. side of the border against the Sinaloan cartel with logistics that included an attack heli-copter. Witnesses reported the helicopter firing tracers into a condo unit, and cartel big shots got taken out, permanently. That’s the story they tell around town, along with the one about El Chapo, but otherwise the place is serene, and a great place for Montanans to visit. Antonio though, who had been deported from the U.S. for a narcotics offense, revealed another side of the Sinaloan equation. They look like you or me, he said. Nobody knows who they are. He told me not to worry though, that they do not harm tourists, nobody does, because if they do, vigil-antes descend and kill them, like those of the Old West, in Virginia City, who served commercial interests as law enforcement surrogates. That’s an effective deterrent, I said, getting killed. Antonio nodded in agreement. Peñasco is safe. You can get there fast. Spend an afternoon at Casa Del Capitan. Eat oysters, swim in the sea. Be happy.